Jacques Bodin is a French painter who lives and works in Paris. He has been in numerous gallery shows and his work has been featured in many books and publications. Most of his paintings are made in an almost absurd scale and magnification, so the subject becomes a kind of abstraction, separating it from ordinary reality and endowing it with a life of its own. The hair, the orange and the herb become a world in itself, a microcosm. He focuses on the essential of his subjects. "My work explores diverse subject themes such as fruits, hair, grass, trees and is organized in the manner in which I capture my subjects and depict them with meticulous attention. Approaching minimalism, some of the works embark on a conceptual aspect of hyperreality. 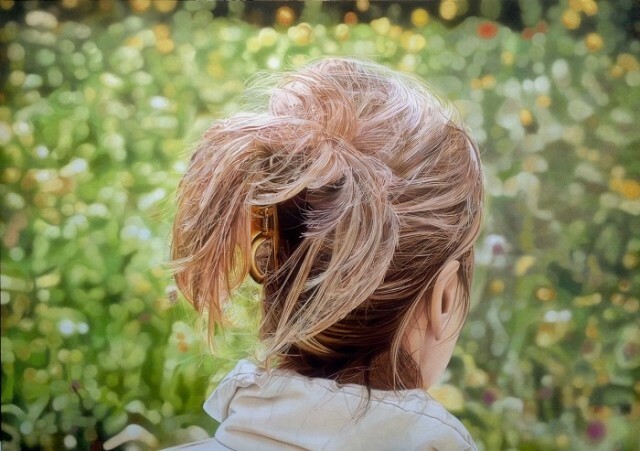 My paintings accentuate photographic deviations from reality (depth of field, wide angle, lighting, and focus anomalies) to create a hyperrealism reference. Subject matter includes extreme closeup views of exacting images cast in shadow through reflective lighting. My paintings, generally of large dimensions (sharp focus, gigantic scale), are executed from photos projected on the canvas from a video projector."